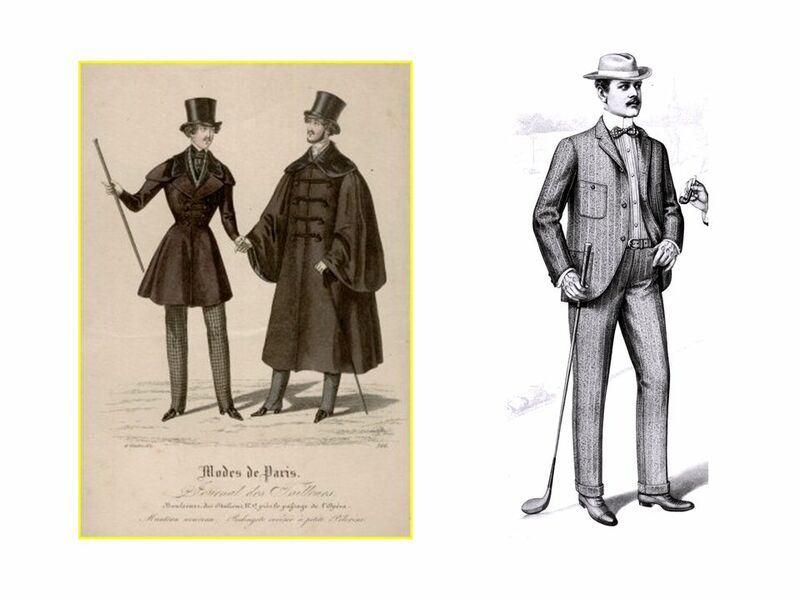 3 Modern Times 1837 costume drama, 1901 Familiarity. 1901 environment looks like home. The men wear shirts and ties and jackets, take the train to work, telephones sit on the desks, a secretary works at a typewriter, newspapers are the same - tabloids and broadsheets. It is our world. 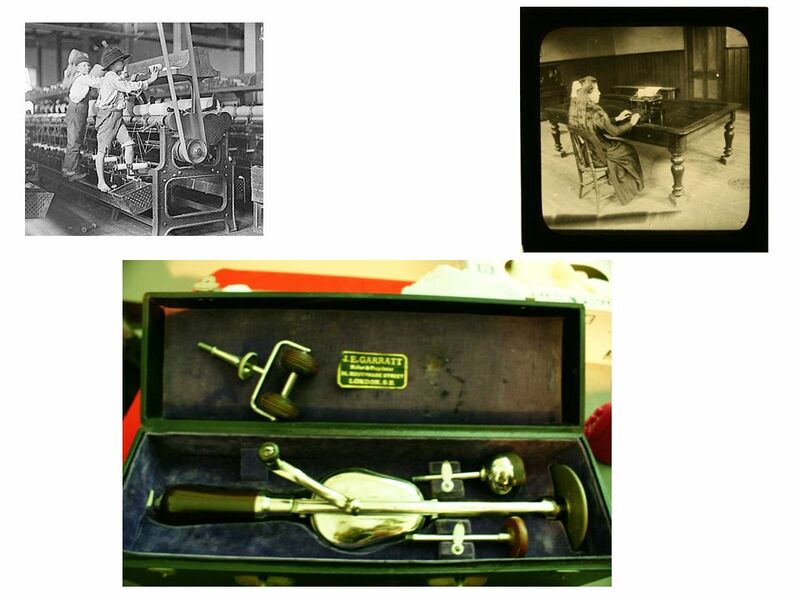 Victorians placed science and technology on a pedestal to go alongside religion. They invented the `city`, the `seaside`, the` countryside`. Sent boys up chimneys, but also stopped sending boys up chimneys and stopped the slave trade. 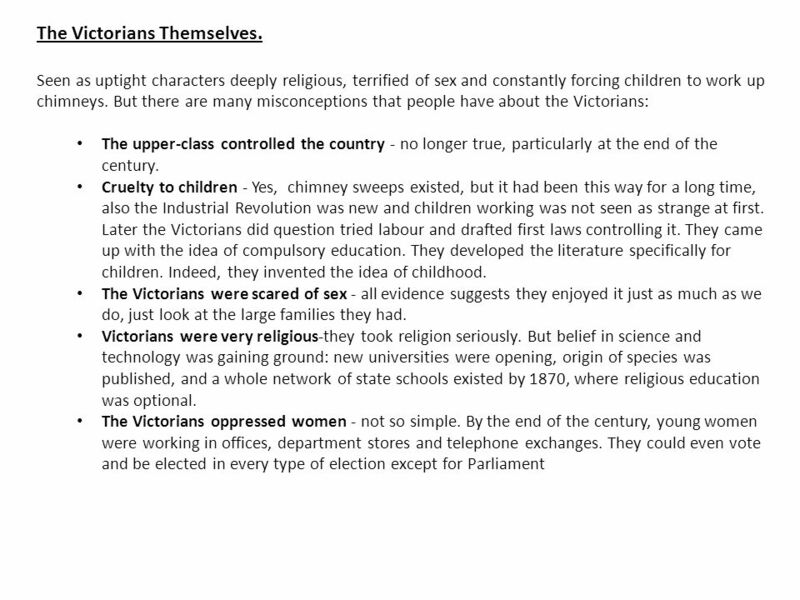 Victorians were full of contradictions, but they made our world. Ultimately, they made us. Queen Victoria. Gave her name to these people and the age in which they lived. Her reign had a rocky start-coronation was a shambles and the Queen thought she could do anything she wanted: couldn’t keep her Whig Prime Minister, Lord Melbourne, couldn’t keep her ladies of the bedchamber (`The Bedchamber Crisis`). Queen Victoria unpopular but saved by her handsome young cousin-Albert. Although Albert couldn’t keep Victoria neutral. He was a great asset to the monarchy: the Great Exhibition, patron of science, technology and education, founded museums and institutes and helped keep Britain out of the American Civil War. In short, he kept Victoria on the straight and narrow. Victoria under his spell. Albert died in 1861. Victoria distraught and retreated from public life and had to be coaxed back by Disraeli whom she admired. Her reign spanned 64 years and she presided over an age when Britain changed almost beyond recognition. Sir Robert Peel. Prime Minister twice: and One of the greatest prime ministers of the 19th century. As Home Secretary he established the police force. As Prime Minister he single-handedly financed Britain’s economic expansion by cutting import duties. Also came up with a new tax, income tax. Peel’s career, however, was brought to a sudden end by the Irish famine. 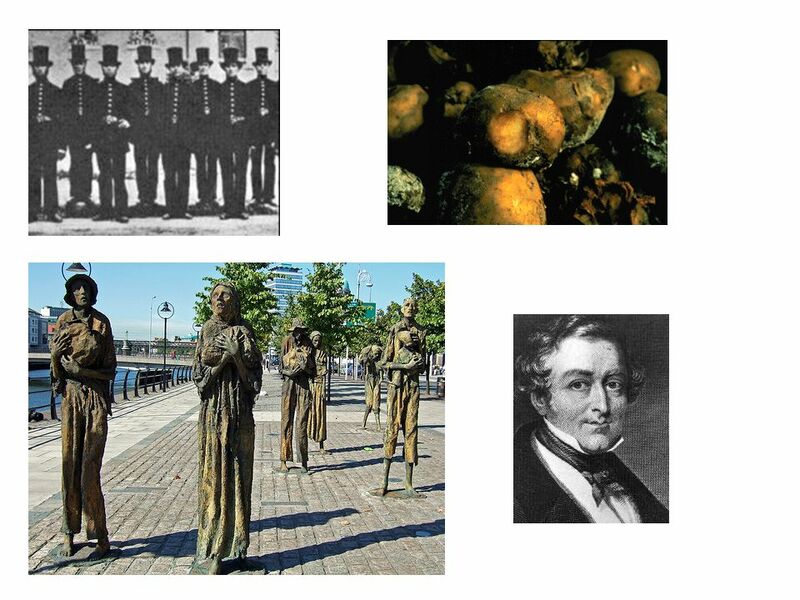 The Irish Famine In the 1840s 1 million people in Ireland starved to death. Potato blight. The authority’s reaction seemed to make a terrible situation even worse: Government provided work usually road building. Church of England set up a food stations, sometimes aid dependent on conversion. The English soon began to suffer from compassion fatigue. Sir Robert Peel refused to give out free food, but eventually relented and allowed in American maize, but this proved useless. Some argue Irish famine was genocide, but rather it was ineptitude, the government had no idea how to cope with such a situation. 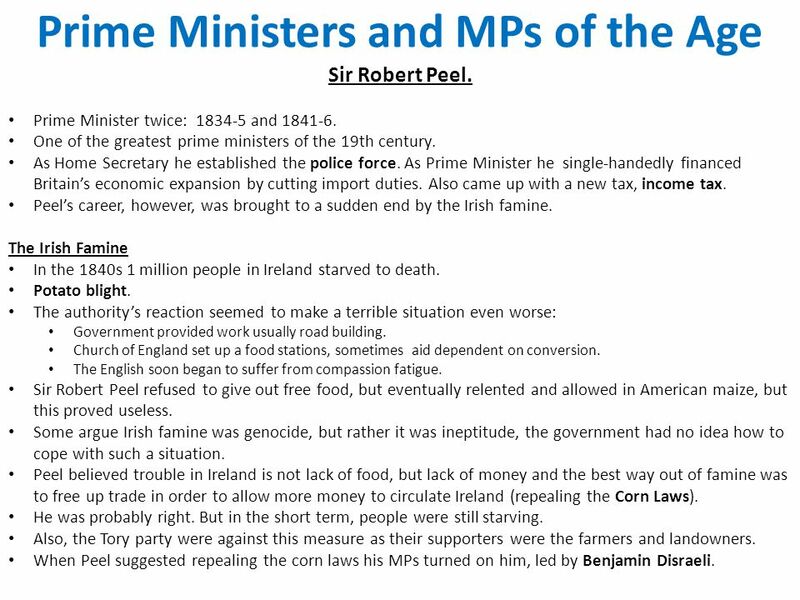 Peel believed trouble in Ireland is not lack of food, but lack of money and the best way out of famine was to free up trade in order to allow more money to circulate Ireland (repealing the Corn Laws). He was probably right. But in the short term, people were still starving. Also, the Tory party were against this measure as their supporters were the farmers and landowners. When Peel suggested repealing the corn laws his MPs turned on him, led by Benjamin Disraeli. Victorians believed in free trade as a way for nations to get on in peace and harmony. Free trade would mean prosperity and freedom and love and peace and the universal happiness. Manufacturers and industrialists main proponents of free trade. Free traders set up a huge lobby, the Anti-Corn Law league. A conflict between industrialists and farmers. Peel repealed the corn laws in 1846, but this led to him losing his job. 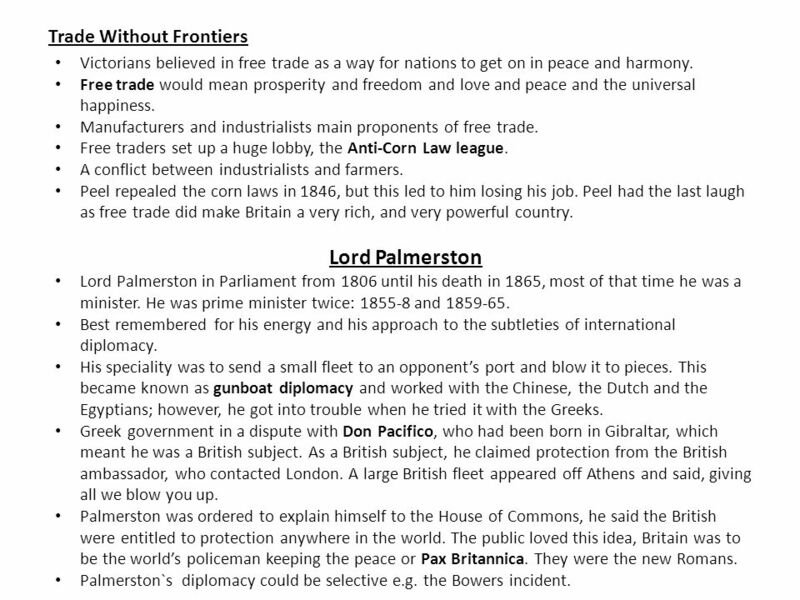 Peel had the last laugh as free trade did make Britain a very rich, and very powerful country. Lord Palmerston Lord Palmerston in Parliament from 1806 until his death in 1865, most of that time he was a minister. He was prime minister twice: and Best remembered for his energy and his approach to the subtleties of international diplomacy. His speciality was to send a small fleet to an opponent’s port and blow it to pieces. This became known as gunboat diplomacy and worked with the Chinese, the Dutch and the Egyptians; however, he got into trouble when he tried it with the Greeks. Greek government in a dispute with Don Pacifico, who had been born in Gibraltar, which meant he was a British subject. As a British subject, he claimed protection from the British ambassador, who contacted London. 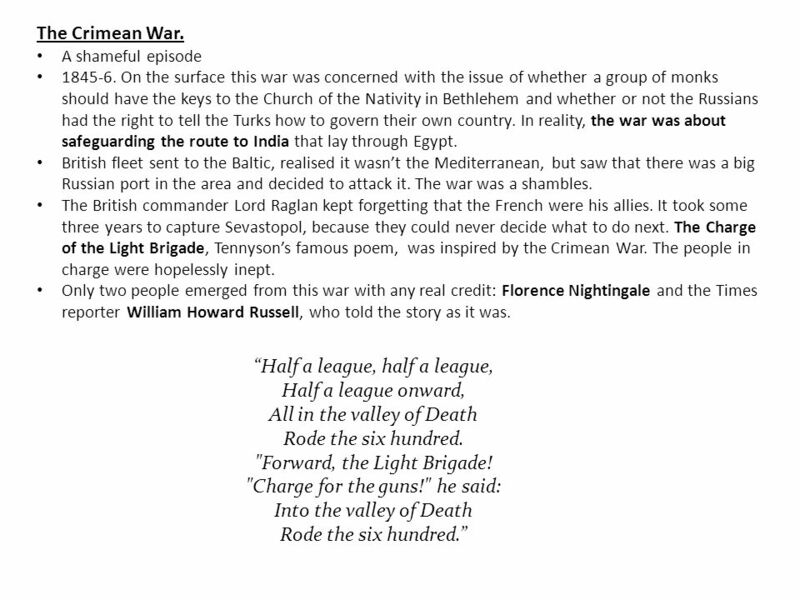 A large British fleet appeared off Athens and said, giving all we blow you up. Palmerston was ordered to explain himself to the House of Commons, he said the British were entitled to protection anywhere in the world. The public loved this idea, Britain was to be the world’s policeman keeping the peace or Pax Britannica. They were the new Romans. Palmerston`s diplomacy could be selective e.g. the Bowers incident. Two political leaders with real star quality. 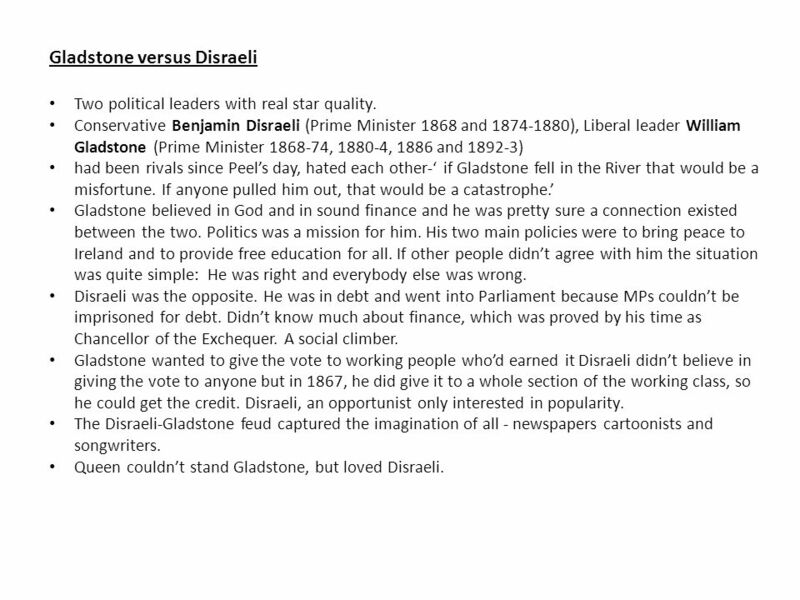 Conservative Benjamin Disraeli (Prime Minister 1868 and ), Liberal leader William Gladstone (Prime Minister , , 1886 and ) had been rivals since Peel’s day, hated each other-‘ if Gladstone fell in the River that would be a misfortune. If anyone pulled him out, that would be a catastrophe.’ Gladstone believed in God and in sound finance and he was pretty sure a connection existed between the two. Politics was a mission for him. His two main policies were to bring peace to Ireland and to provide free education for all. If other people didn’t agree with him the situation was quite simple: He was right and everybody else was wrong. Disraeli was the opposite. He was in debt and went into Parliament because MPs couldn’t be imprisoned for debt. Didn’t know much about finance, which was proved by his time as Chancellor of the Exchequer. A social climber. Gladstone wanted to give the vote to working people who’d earned it Disraeli didn’t believe in giving the vote to anyone but in 1867, he did give it to a whole section of the working class, so he could get the credit. Disraeli, an opportunist only interested in popularity. 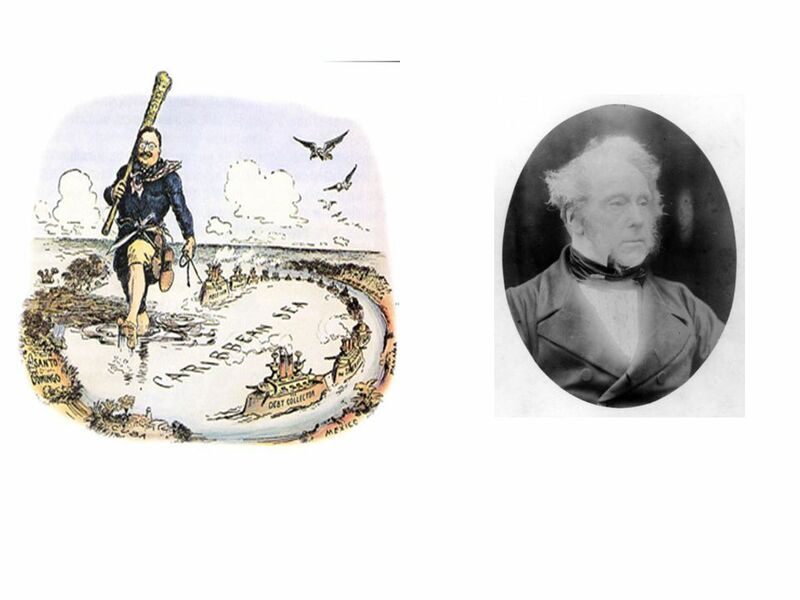 The Disraeli-Gladstone feud captured the imagination of all - newspapers cartoonists and songwriters. Queen couldn’t stand Gladstone, but loved Disraeli. 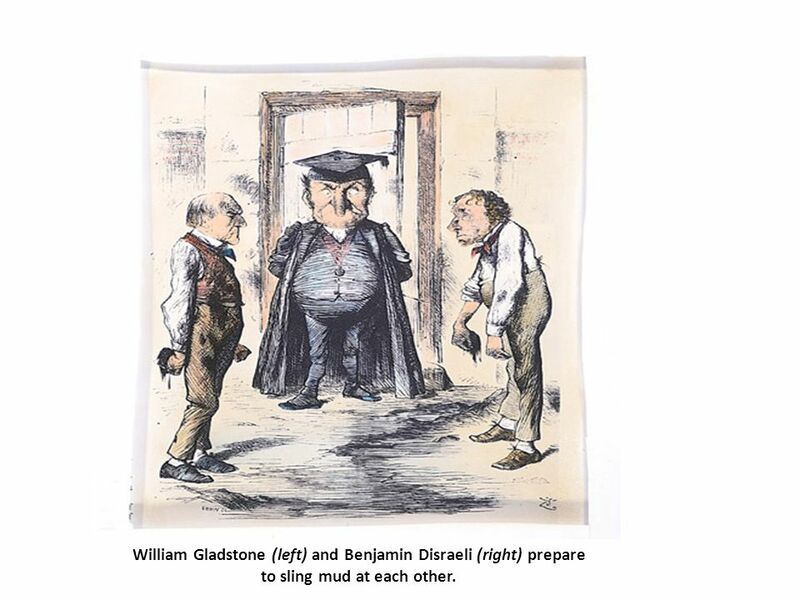 10 William Gladstone (left) and Benjamin Disraeli (right) prepare to sling mud at each other. The People’s Charter. When Queen Victoria came to the throne working people did not have the vote; the very people who did all the work which made Britain great. The Chartists, in 1838, drew up the People’s Charter. They didn’t just want the vote. They also wanted: equal electoral districts, no property qualifications for MPs, payment for MPs, secret ballots, and annual parliaments. The Chartists weren`t revolutionaries; what they wanted was a fully working democracy with power in the hands of the people. Petitioning Parliament. 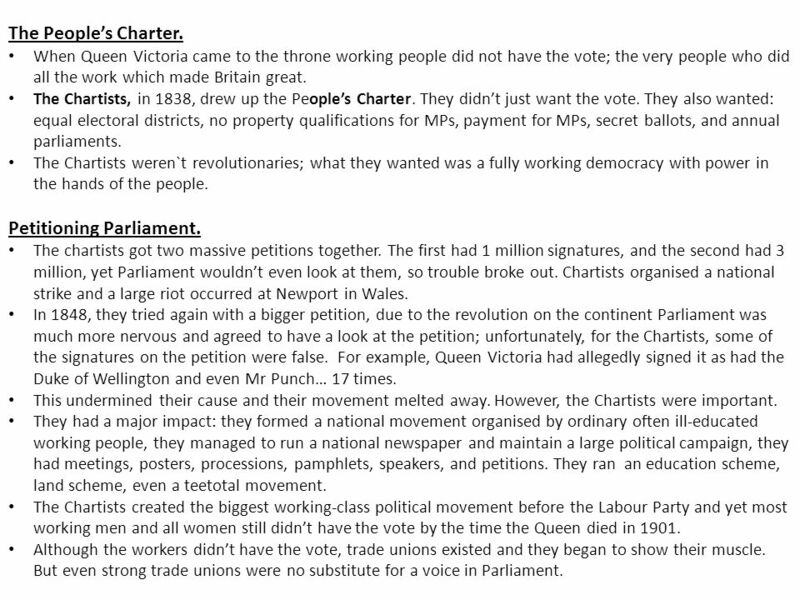 The chartists got two massive petitions together. The first had 1 million signatures, and the second had 3 million, yet Parliament wouldn’t even look at them, so trouble broke out. Chartists organised a national strike and a large riot occurred at Newport in Wales. In 1848, they tried again with a bigger petition, due to the revolution on the continent Parliament was much more nervous and agreed to have a look at the petition; unfortunately, for the Chartists, some of the signatures on the petition were false. 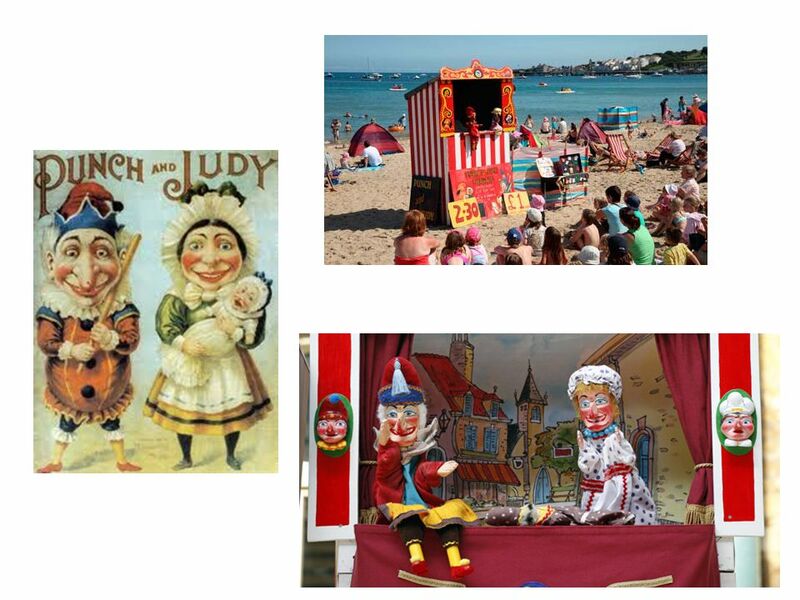 For example, Queen Victoria had allegedly signed it as had the Duke of Wellington and even Mr Punch… 17 times. This undermined their cause and their movement melted away. However, the Chartists were important. They had a major impact: they formed a national movement organised by ordinary often ill-educated working people, they managed to run a national newspaper and maintain a large political campaign, they had meetings, posters, processions, pamphlets, speakers, and petitions. They ran an education scheme, land scheme, even a teetotal movement. The Chartists created the biggest working-class political movement before the Labour Party and yet most working men and all women still didn’t have the vote by the time the Queen died in 1901. Although the workers didn’t have the vote, trade unions existed and they began to show their muscle. But even strong trade unions were no substitute for a voice in Parliament. 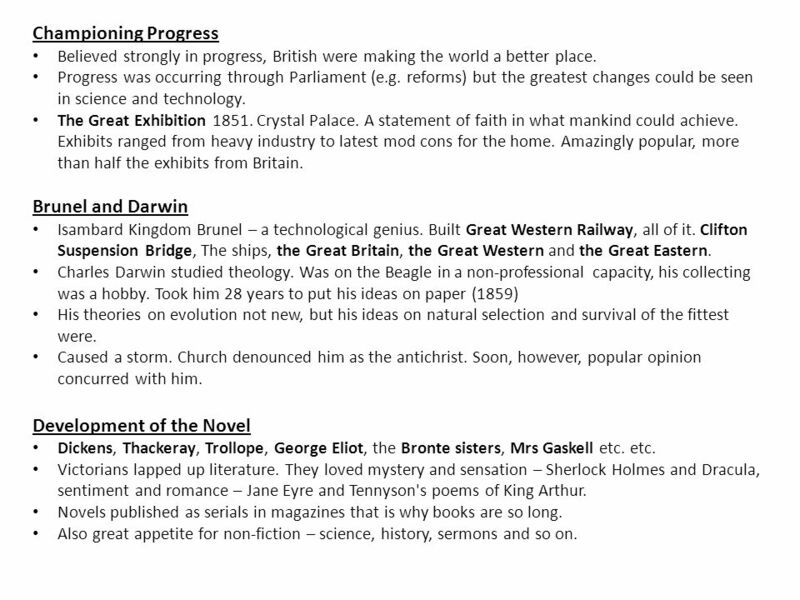 Championing Progress Believed strongly in progress, British were making the world a better place. Progress was occurring through Parliament (e.g. reforms) but the greatest changes could be seen in science and technology. 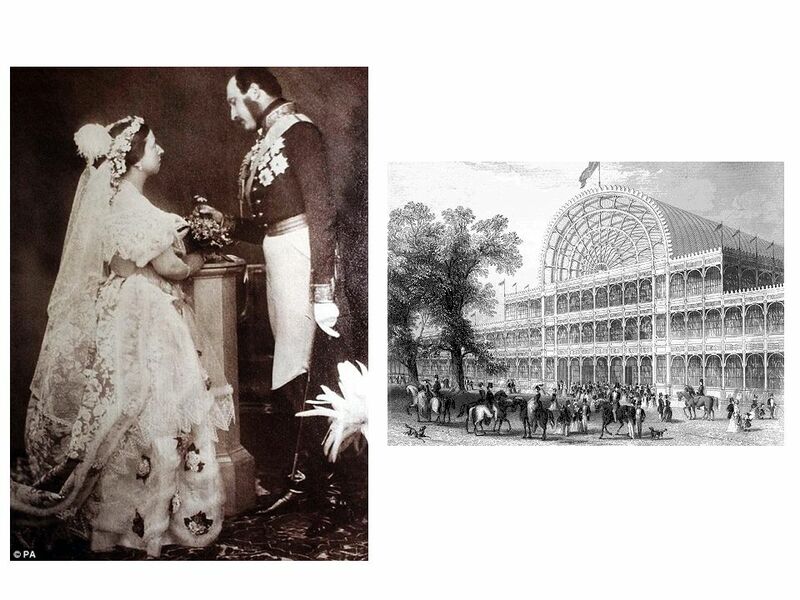 The Great Exhibition Crystal Palace. A statement of faith in what mankind could achieve. Exhibits ranged from heavy industry to latest mod cons for the home. Amazingly popular, more than half the exhibits from Britain. 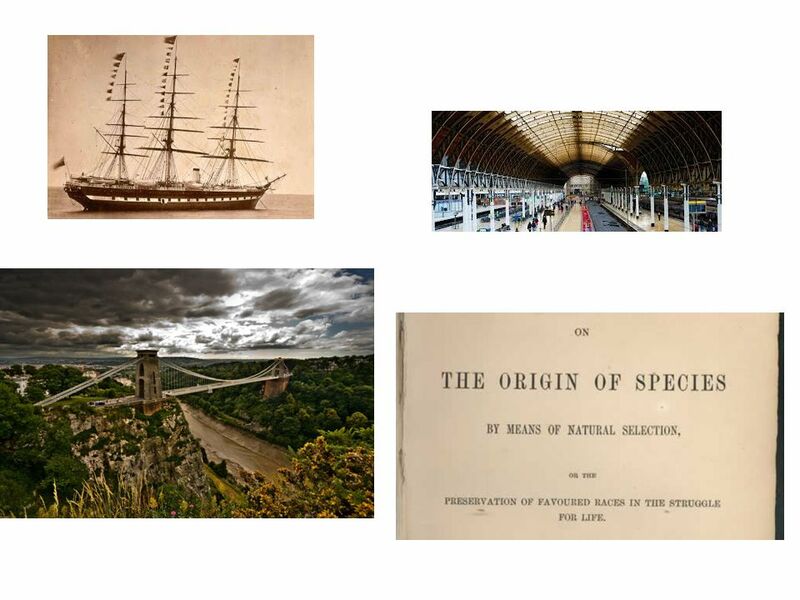 Brunel and Darwin Isambard Kingdom Brunel – a technological genius. Built Great Western Railway, all of it. Clifton Suspension Bridge, The ships, the Great Britain, the Great Western and the Great Eastern. Charles Darwin studied theology. Was on the Beagle in a non-professional capacity, his collecting was a hobby. Took him 28 years to put his ideas on paper (1859) His theories on evolution not new, but his ideas on natural selection and survival of the fittest were. Caused a storm. Church denounced him as the antichrist. Soon, however, popular opinion concurred with him. Development of the Novel Dickens, Thackeray, Trollope, George Eliot, the Bronte sisters, Mrs Gaskell etc. etc. Victorians lapped up literature. They loved mystery and sensation – Sherlock Holmes and Dracula, sentiment and romance – Jane Eyre and Tennyson's poems of King Arthur. Novels published as serials in magazines that is why books are so long. Also great appetite for non-fiction – science, history, sermons and so on. 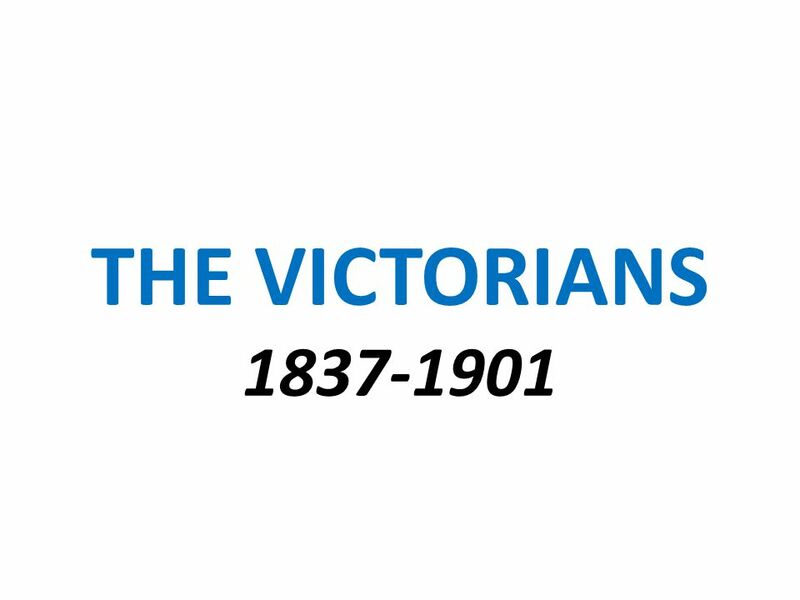 Download ppt "THE VICTORIANS 1837-1901." Types of Government Lesson 3. Reforms, Revolutions, and War Section 1. Reforms, Revolutions, and War Section 1 Preview Starting Points Map: European Possessions Main Idea / Reading. The Victorian Period A Time of Change London becomes most important city in Europe: Population of London expands from 2 to 6 million Impact. Active Vocabulary Monarch monarchy democracy parliament parliamentary political government constitutional. 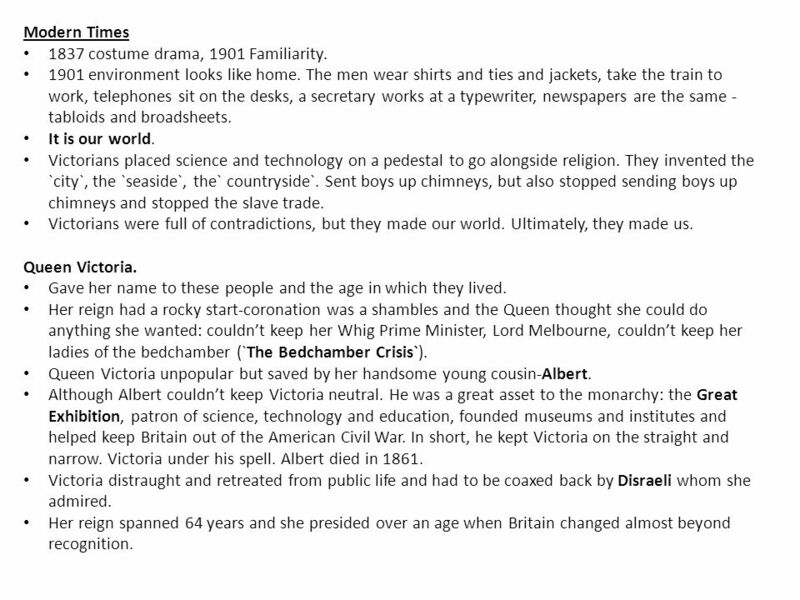 Queen Victoria ( ) Victoria was Queen of the United Kingdom of Great Britain and Ireland for 63 years. It was the longest reign in England’s history. The Avignon Papacy. What is going on? During the 13 th -14 th centuries everything seemed to go wrong Christendom is disintegrated – Nations are fighting.